Q: What are the new FIRPTA requirements? The Foreign Investment in Real Property Tax Act (FIRPTA) requires foreign persons to pay U.S. income tax on the gains they make from selling U.S. real estate. FIPTA imposes a duty on a U.S. national buyer to deduct and withhold a portion of the sales price and to report the sale to the IRS. But typically the closing attorney would handle this withholding and remittance to the IRS on behalf of their client, the buyer. 1. If the property will not be used as the buyer's primary residence, the withholding rate is 15% of the amount realized (generally the sales price), and reporting is required. 2. If the amount realized is $300,000 or less, AND the property will be used as the buyer's primary residence, the withholding rate is 0%, and no reporting is required. 3. If the amount realized exceeds $300,000 but does not exceed $1,000,000, AND the property will be used as the buyer's primary residence, the withholding rate is 10% of the amount realized, and reporting is required. 4. If the amount realized exceeds $1,000,000, then the withholding rate is 15% of the amount realized, regardless of use by the buyer, and reporting is required. The IRS has released new versions of Form 8288 and 8288-B to reflect the increase in the FIRPTA withholding rate and effective date, February 17. The traditional FIRPTA affidavits that closing attorneys have been using are still important to obtain the confirmations necessary to comply with the above requirements, -- especially the buyer's intention to use as their primary residence. The Protecting American Taxpayers from Tax Hikes (or "PATH") Act, H.R. 2029, that became law on December 18, 2015 as Public Law 114-113. See Section 324 of the bill, which amends 26 U.S. Code §1445. Q: What issues might be revealed by a title survey that may not be revealed by the title search? A: A survey is a measured drawing of a tract of land showing the boundaries of the property and the physical location of all significant improvements and easements affecting the land. Without a current survey, prospective property owners really do not have any assurance that they are getting what they think they are buying. An accurate survey will reveal if there are any setback violations, encroachments of improvements or fences into easements or across property lines, recorded but undisclosed easements and the correct location of property lines and improvements. A survey will reveal whether the main structure is even located on the lot being sold! There have been occasions where a house has been built on an adjoining lot, owned by the seller, next to the one conveyed at closing. These are just a few of the problems that a survey might reveal. These are equally applicable to urban and rural settings. In most transactions, the attorney's title examination will not reveal the kinds of problems that a survey should disclose. An attorney's title examination is limited to such matters, affecting title as are disclosed in the records of the local county courthouse. The majority of what is shown on the survey is the result of the surveyor's inspection and physical measurement of the property and improvements. As a result, a buyer of property needs a title examination and a survey in order to be accurately informed of what is actually being purchased. It is the general practice in the title insurance industry to give survey protection in lender's title insurance policies without requiring a current survey. The primary reason for title insurer's willingness to provide such coverage to lenders is that lenders will not normally have a claim against the title policy until there has been a default in the loan and the survey defect reduced the foreclosure sales price below the payoff amount. Title insurers have found that there tend to be fewer lenders' policy claims arising due to lack of survey than arise due to incorrect surveys. This coverage is not extended to the owner because the claim for a defect would arise immediately upon issuing the owner's policy. This explanation is an over-simplification but it is helpful to understand what a lender means when they tell a borrower 'you don't need a survey'. What the lender really means is that the lender will not require the borrower to get a survey as long as the lender is protected by the title insurer. The typical purchaser believes that if the lender is satisfied, if the attorney has searched the title and if a title insurance policy has been delivered that, they are adequately protected. This clearly is not the case where a survey has not been obtained. Q: I am working to refinance my current residence. Two years ago I closed on a loan. Will the title insurance be the same rate as it was the first time? A: In most circumstances a refinance will afford you a reduced rate on your lender's title insurance policy. 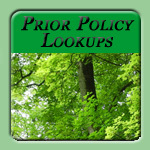 When there is an existing policy, a re-issue discount of 50% is generally available for new policies up to the amount of the original owner's policy coverage. In the case of an insured owner refinancing within 10 years such as in your question the premium would be 30% of the regular premium for coverage up to the amount of your owner's policy coverage. Any coverage over that amount would be at regular rates. We have a premium calculator on the menu of our website for the convenience of our customers. For example, if your original coverage was at least $300,000 and if your lender requires ICS coverage, your premium would be $372.50 (as of May 1, 2015). Q: I'm getting an easement to access one lot through a neighboring lot. Does the width of the easement matter for title insurance or bank financing purposes? A: The width of your access easement can have a significant impact on your use of the property and its value. We strongly urge you to consult with your attorney, your lender, your insurance agent and local authorities before making any decisions on this issue. Note also that a short and straight easement that is narrow may not be as problematical as one that is steep, long, winding and narrow. Generally, title insurance only insures that property has legal access of some kind. It does not insure the quality or character of that access. While a policy would not insure that this particular easement is adequate for any purpose other than bare legal access, the fact that an easement is, for example, only ten feet in width would not normally prevent the issuance of a title policy. Obviously, that would not satisfactorily address any issues that might result if the access proved too narrow for your purposes. Your lender may have different concerns and must be consulted. Access that is considered inadequate in your area could lower the property's value and result in a lower loan eligibility. If your lender sells its loans in the mortgage market, the investors may have specific requirements that may affect the lender's ability to sell the loan. Your lender can advise you whether your easement would create any problems in this regard. In addition, you should consult all local zoning authorities. In certain instances, lack of an adequate width of an access easement may restrict emergency vehicle access and that could result in a denial of building permits for construction or even for major repairs. This issue can also result in your finding it difficult or expensive to secure fire and casualty insurance on the property. Q: What does it mean if a title insurance company is willing to "insure over" a defect for an additional fee? A: It is not unusual for a title search to reveal minor defects and encumbrances that a title insurer is willing to assume the risk of providing coverage against a potential loss occurring as a result of the defect. In such cases the insurer will not require the defect to be cured. This practice is referred to as "insuring over" the risk. In more serious instances the insurer will require the defect to be cured and eliminate all risk. This can be expensive and time consuming. It is often not considered worth the effort if the defect is technical or remote. In some jurisdictions, insurers are permitted to charge an additional premium for assuming the additional risk. In states such as NC such charges are not permitted. Q: When we bought our home in 70's, we were issued an owner's title insurance policy. We have kept the policy with our other important documents such as our other insurance policies, wills, deeds, and the like. Has this title policy expired? Are any additional premiums due to keep it current? How long should we keep that policy? A: An owner's title insurance policies is in effect as long as the insureds named in the policy or their heirs own the property. In this case, the policy is still valid in case an insured title problem arises. Premiums are paid once at issuance and no further premiums are required to keep the policy in effect for the original owner. Keep that policy as a permanence document. It will even protect your heirs from title risks. In some circumstances it will even protect you from some title claims of a purchaser of your property caused by one of your prior owners. Q: Is it possible to obtain a legal access to landlocked property if surrounding land owners refuse to sell ROW or give easement? There was once a state maintained road across property. Is the Cartway Act still active in the legislature? A: There are many ways that access is obtained other than by grant. Cartways as you note, prescriptive easements, other implied easements and old neighborhood public roads are just a few. A meaningful answer to your question as to whether any of these apply, can only be provided by a competent title examination of the property in question conducted by an attorney experienced in real property transactions (preferably local). The most recent cartway proposal in the legislature is dead. It will likely reappear in the 2005 session, but there is a lot of opposition to these proposals and I am not optimistic about their chances. Q: I have a remote property with a righted ingress / egress road from a neighbors property. The road borders my property for 245 feet. Do I have the right to access my property from anywhere along the road? There is no obstruction anywhere on the road. A: Generally, access is permitted anywhere along a road frontage. This general right may well be limited by state or local regulations, restrictive covenants, limitations in the grant of a right of way or similar restrictions. We are prohibited by state law from providing legal advice. A useful answer to your question would require an investigation of the land records involving your property and accompanying access rights, together with an opinion of an attorney experienced in real property matters (preferably a local attorney). Q: What is a correction endorsement? A: A Change or Correction Endorsement (CLTA 110.3) form is used for general purposes to correct errors on policies or commitments or other "housekeeping" details which do not provide extra or affirmative coverage. There are no particular underwriting requirements. This endorsement may not be used to provide affirmative coverage but must be used only for correction of minor errors, changing date of commitments and other necessary changes or corrections on policies or commitments. We do not typically use this form in NC. Instead we use a general endorsement form. Q: On a refinance, if the Owner has added a deck or made any other structural change since the last survey, will you insure the Lender without a current survey? A: Yes, as long as the changes are not believed to encroach on any property lines. Q: What are the responsibilities between buyer and seller relative to termite inspection and repairs in North Carolina? A: The responsibilities between buyer and seller relative to termite inspection and repairs in North Carolina are strictly determined by the contract of purchase and sale. Any questions concerning a specific transaction should be referred to a qualified attorney licensed to practice law in North Carolina. The following is a general discussion of residential closing practice in North Carolina. It is not legal advice and must never be relied upon to resolve an actual issue. In general, it is customary for a buyer to have a right of inspection and the responsibility for paying for the inspection. When active termites are found, residential contracts will typically require the seller to pay for treatment. If there is structural damage, the contract will often give the seller the option of making repairs, adjusting the price or doing nothing. If the seller does nothing, the buyer may accept and close or be released from the contract with a refund of earnest money. All of these contract terms are negotiable. It is not uncommon for a specific contract to vary from customary terms. Therefore, we strongly urge that North Carolina legal counsel be consulted to interpret the contract if this question concerns an actual transaction. Q: Can you insure on landlocked property? This property has a visible and apparent easement that has been in use for more than 25 years, but there is no easement dedication of record nor is there a deed of record give the landlocked property owner ingress/egress. Is the easement valid for ingress/egress? If not, what is required by the title company to issue? A: It is very difficult to answer your question in such a general form since our ability to insure over such issues is extremely situation specific. However, I will try to give you some insight to how we approach these problems. Facts - This property has a visible and apparent easement that has been in use for more than 25 years, but there is no easement dedication of record nor is there a deed of record give the landlocked property owner ingress/egress. Q.- Can you insure landlocked property? A.- Yes, we can insure landlocked property. If there really is no legal access, we must take exception to the lack of access. Q.-Is the easement valid for ingress/egress? A.- In NC, the legal presumption is that such use is permissive. If a use is in fact permissive, it can never give rise to a right of access. Q.- If not, what is required by the title company to issue? A.- We need clear and convincing evidence that the access has been claimed and acceded to as one of right, not permission. We will also need to be satisfied that it is very unlikely that access will be contested in the future. Q: There is an encroachment or setback violation shown on the current survey. Will you insure over this problem? A: Depending on the severity of the encroachment/violation, and the length of time it has existed, we can generally give the lender affirmative coverage over the problem. However, we consider these on a case-by-case basis and in favorable circumstances we may affirmatively insure the owner against enforced removal. Q: Will you give survey coverage to our lender? A: Generally, on residential property, if a survey has been done in the past, or the property has been platted, we will give the lender survey coverage. Q: We have an open estate, and the property is being sold. Can you insure? A: This is handled on a case-by-case basis and depends on the status of the estate. This should be discussed with a senior underwriter or our legal counsel. Q: Can we tack on to a policy written by another underwriter? Q: Do we have to use your forms? A: No. You may use the title opinion forms, etc. that you are comfortable with and generally accepted in the practice of real estate. Q: In purchasing rural residential property, is a survey mandatory for title insurance? The property hasn't changed hands in 30 years and there is no existing survey available. A: Ordinarily, a survey is not "mandatory" for the issuance of a title policy. Even so, the lack of a current survey will result in an exception appearing in the owners' policy for losses arising from matters that a current survey would reveal. Occasionally, a property description for an older deed will not be legally sufficient to describe a tract according to modern standards. In such instances we sometimes require a survey before agreeing to issue a policy. In most cases it is a prudent investment for a purchaser to secure a survey of property that has not been recently surveyed. Matters that would not normally be revealed by a title search will often be disclosed by a survey. Without the survey, such matters will normally be excluded from policy coverage and could result in a substantial financial loss for the purchaser. Q: If I have a building within my property boundaries but built across the side setback, is it considered an encroachment on the neighboring property? A: Generally speaking, a setback encroachment violation is not the same as a boundary encroachment and the rules for enforcement are different. In addition, there are subdivision setbacks imposed by a subdivision's restrictive covenants or plats and other setbacks imposed by governmental authority in its subdivision ordinance and the rules for enforcement of these are also different. In such situations, the help you need can only be provided by an experienced attorney after a careful examination of the facts of your problem and the law applicable in that situation. You should consult a competent attorney as soon as possible.